This weekend, check us out at Renegade Craft Fair in Chicago! We'll be there, braving the chilly fall weather and the long hours! Oh, and I promise to get some new stuff added after we get back from Crafty Bastards in October! Washington DC September 30th from 10-5!! Check it out!! If you think we should sell this purse in the shop, please leave a comment! Also, if you're interested in something custom, please email me at katie@barrysfarm.com to work something out! music: Tegan and Sara, "The Con"
We had a great time and hopefully, we'll be a part of upcoming Art vs. Craft shows! We'll be at Art vs. Craft in Milwaukee July 7-8! Check it out! Whew! It sure has been a busy month around here! We're doing a much better job of staying on top of orders and I think I've gotten into a groove that allows me to stay caught up and not have to work constantly! We just bought a nice professional button machine, so the buttons are being made much quicker and look more professional. Hopefully we can come up with some new designs to put it to good use! I purchased a bunch of new fabrics both online and on trips to Chicago, so I hope to add them soon. Also, I was able to score decent yardage of several fabrics so I hope to make some prototypes for a new case that would be fabric with vinyl handles for the ladies out there! I'm also working on some purses that i would like to debut soon, as well as ipod cases and notebooks made out of children's records. We're getting ready to apply for 2 upcoming big craft shows- Renegade Craft Fair (Chicago) and Crafty Bastards (Washington D.C.). Both would be in September, but if we end up at Crafty Bastards, we'll probably take a nice road trip up the east coast! We were accepted to Art vs. Craft, which is in Milwaukee from July 7-8, so if you're in the area, stop by and say hi! That's about all for now. Here's a pic to show evidence of progress (and our fuzzy monster army!)! We were on Business Week Weekend this morning. It's a national news program that mostly runs on ABC. Around the midwest it airs at 5:30AM, but on the east coast it's on at 11:30AM. They took our monster sleeve and the 9-5 sleeve out on the street and asked people if they'd carry it! Totally Cute. This month for our Sampler picks, I had everyone choose a favorite. Here they are, in a clockwise fashion. Meredith loves the Cupcake Clutch from Barry’s Farm. 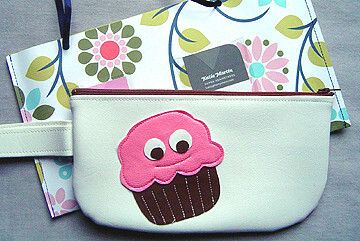 It’s really playful — the face alone makes me smile, and there are even more smiling candy treats on the inside lining! I would have had a blast using this as a pencil case to gaze into while sitting through a long (i.e. boring) class back in school. For the Birds stationery by Ephemera Stationery - Link. Button holder frame by Button Collective - Link. Wolfie and the Sneak Say coloring card - Link. Sublime Stitching's Lucha Libre embroidery patterns - Link. Silver Swirl pearl necklace by Beadoodles - Link. Barry's Farm Ice Cream vinyl wristlet - Link. Jill Bliss + My Favorite Mirror Set of 6 beverage coasters - Link. The Sampler is a great way to promote your crafty business! For more Sampler news and info on how you can contribute, visit The Sampler web site. Now to think of what to contribute to next month's Sampler! In other news- I just ordered one of those cool new Bind-it-all machines, so look for handmade journals/notebooks in the near future! My first week in self-employment went really well! It's so nice to be able to work from home, with the windows open and music playing! Sure beats the hell out of my previous cubicle imprisonment! We're going to be on another TV program! It's called Business Week Weekend and it's going to be on Sunday, May 6th. Around here, its on CBS at 5:30 am (we're so Tivo-ing it! ), but on the East Coast, I think it's on at 11:30, so check your listings! We're working on some possible wholesale and consignment deals with awesome people. We've almost sold at least one of everything in the store now! I've been waiting for someone to buy one of the tree sleeves forever, and it finally happened! Hooray! Modish had some nice things to say: A cute little pick me up clutch by Barry's Farm- the one I received is vinyl with a happy little strawberry ice cream cone on it. It's well made and I must say, cute enough to eat! Yum! There’s no coincidence to this: yesterday the sun made one of its increasingly-rare appearances in Portland, and The Sampler arrived. 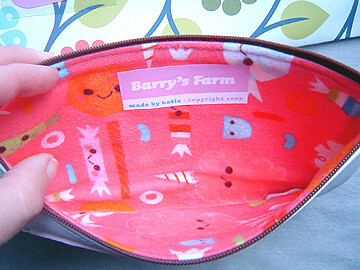 This cute-cute-cute zippered bag from Barry’s Farm. There’s machine embroidery on the cupcake! And the envelope it came in is so pretty - and also machine-stitched.
. . . But then when you look inside –aah! There’s a flannel lining, complete with smiling candy. I adore this bag. And you must go to the website and see the t-shirt with the marshmallow roasting the man over a campfire. Finally, lots of orders from all over the world! We've had orders from Sweden, France, Singapore, Australia, Argentina, Germany, UK, and many more! We have some awesome customers! Thanks everyone! We took the pics at Barry's office in their amazing conference room. I guess this is what a board meeting at a major PC company would look like- a sea of ties and white shirts! All this work has led me to make the decision to work from home from now on because it has really become a full-time job. It's a scary leap, but I'll have some freelance work to fall back on, as well. So, if anyone has any new product ideas, leave a comment!